VENTURA — While the Gold Coast Lady Anglers is a saltwater fishing club based in Ventura and open to women of all ages and skill levels, at the heart of it, the organization is much more. “Our mission is to have lots of fun, form solid friendships and share our passion for fishing. We also give back to our community and support each other,” stated Jeanne Zappier, co-founder and president of the club. Having previously belonged to a fishing club in Marina del Rey where she met her friend Jacqui Appell, Zappier was getting tired of the long drives back from weekend charters. It was on one of those late Sunday nights, in traffic driving back from fishing, when she decided it was time to start a local club for lady anglers. “I mentioned my idea to Jacqui on the road back to Ventura: that we should start our own lady anglers’ club. Jacqui agreed, and so we did,” Zappier said. Membership in the club has grown steadily since its inception in 2001 from seven members to a total of 61 today. Meetings are held the second Tuesday of each month at a different member’s home over a potluck dinner where the women share fish recipes and discuss fishing charters, club workshops, fundraising events and all things fishing. “In addition to going on fishing charters and talking about fishing, we are always on the lookout for ways to help our local community,” Zappier said. In March, the ladies joined in the third annual Fish4Food charity event to support the Ventura County Food Share Bank. All of the fish caught went to the food bank. The anglers also have great respect for the ocean and environment, practicing ocean stewardship and marine conservation, Zappier explained. “We partner with the Sportfishing Conservancy, whose mission is ‘recognizing that with privilege comes obligation,’” she said. “We believe in working to maintain our beautiful resources. We practice safe catch-and-release, and we don’t take more fish from the sea than we need. It’s really just commonsense conservation. The club has fundraisers that help pay for the charters. They have their own logo clothing line, cookbooks, a members’ blog and a photo page to showcase pictures of members fishing and showing off their catches. Gold Coast Lady Anglers member Anne Levinson joined the group shortly after moving to Ventura three years ago. She was invited to become a member through a friend, and she said she’s enjoyed every minute of it. “Soon after I became a member, I traveled with several of the women to the Fred Hall Fishing Show. I couldn’t believe the conversations between the women as we drove to the event. All they talked about was equipment they needed to preview, the fishing charters they wanted to book and the different representatives that were showing their goods. 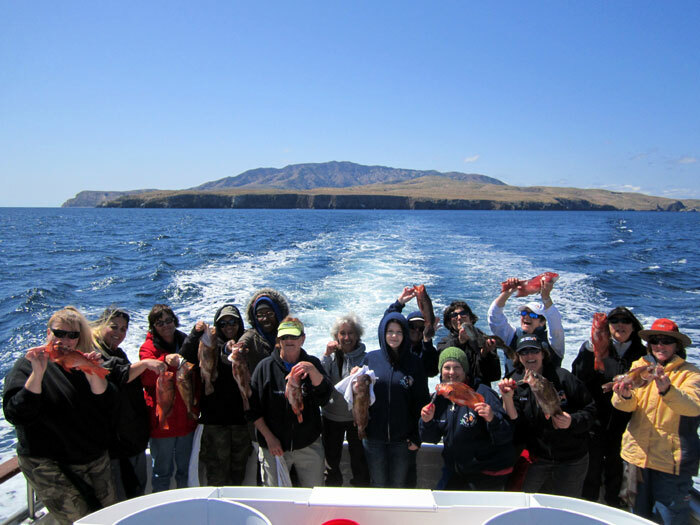 She took her first charter on Mirage out of Oxnard and was surprised that between the 25 club members on board, they caught more than 400 fish. “As a three-year (Gold Coast Lady Anglers) member, I have learned so much that I even impressed my father, who has been fishing all his life,” Levinson said. Levinson said she loves to fish, but she appreciates the friendships she has made as a Lady Angler member even more. “There are so many different women in the club it would be difficult not to make friends,” Levinson said. To learn more about the Gold Coast Lady Anglers or to become a member, visit goldcoastladyanglers.com.